The sun sets behind an oil pump outside Saint-Fiacre, near Paris, France March 28, 2019. 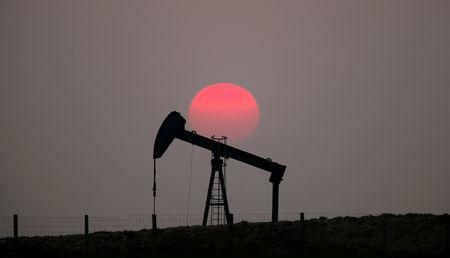 (Reuters) - Analysts have turned cautiously optimistic on crude oil prices this year, predicting that production cuts by OPEC and its allies along with U.S. sanctions on Iran and Venezuela will defy headwinds from robust U.S. output and a dampening global economy, a Reuters poll showed on Friday. A monthly survey of 32 economists and analysts forecast Brent crude would average $67.12 a barrel in 2019, about 1 percent higher than the previous poll's $66.44. "With slower global economic growth, oil demand will not be very dynamic this year," said Frank Schallenberger, head of commodity research at LBBW. "But if OPEC sticks to its production cuts and the U.S. doesn't loosen sanctions against key producers Iran and Venezuela, higher prices are here to stay as we will head to a supply deficit in the second half of 2019." Major producers, led by the Organization of the Petroleum Exporting Countries and Russia, will meet on June 25-26 in Vienna to review their supply cuts. Top exporter Saudi Arabia has advocated an extension of the curbs until the year-end. OPEC compliance with the agreed cuts stood at 94 percent, while non-OPEC was at 51 percent in February, the International Energy Agency (IEA) said. The reductions have pushed prices up more than 25 percent this year. Analysts expect growth in global oil demand to be steady, at 1.2–1.5 million barrels per day (bpd) in 2019. The IEA, in its March outlook, kept its demand growth forecast unchanged at 1.4 million bpd this year. Brent is expected to rise to $68.85 in the third quarter from $67.55 the previous quarter, the poll showed, before higher U.S. output and economic woes bring prices down to $68.40 in the final quarter. "The end of 2019 is likely to see oil prices come under pressure as the U.S. exports greater volumes of its light shale oil supply to international markets and the global economy, in our view, experiences a synchronized slowdown," said Harry Tchilinguirian, strategist at BNP Paribas. The 2019 average forecast for U.S. light crude was raised to $58.92 per barrel from February's $58.18 outlook. Part of the U.S. growth will be due to new pipelines in the Permian Basin that come online in the second half of 2019, said Adrià Morron Salmeron, economist at CaixaBank Research. The spread between Brent and West Texas Intermediate (WTI) crude is seen at $8.65 in the second quarter of 2019, narrowing to $8.04 and $6.85 over the next two quarters respectively. "By the end of 2019, we expect the price differential between WTI and Brent to narrow substantially as growing U.S. exports of light oil come to compete in Atlantic Basin and Asian markets," Tchilinguirian said.